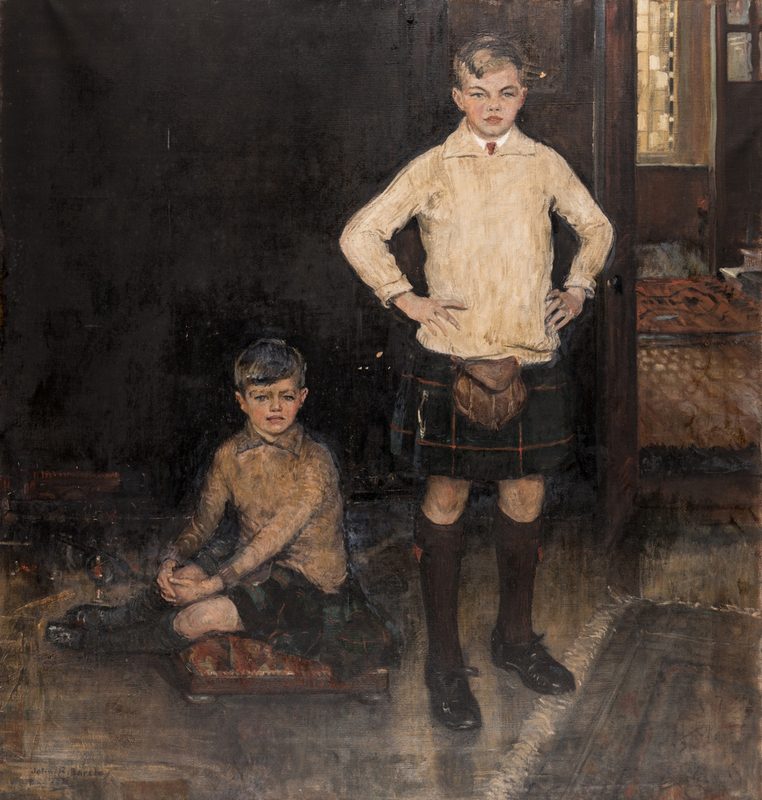 John Rankin Barclay (Scottish, 1884-1962) oil on canvas portrait of Hamish and Alister Gunn. 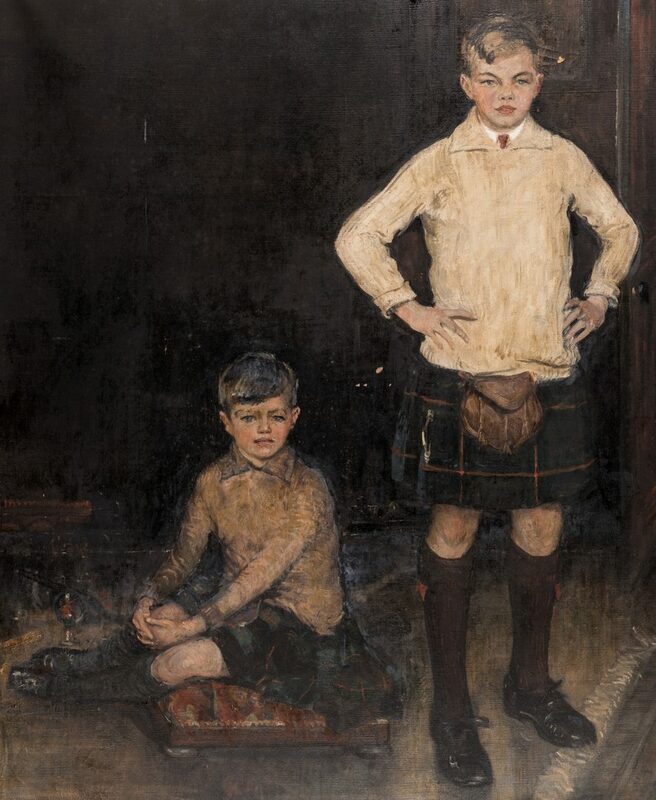 The boys are depicted wearing Scottish tartan kilts. 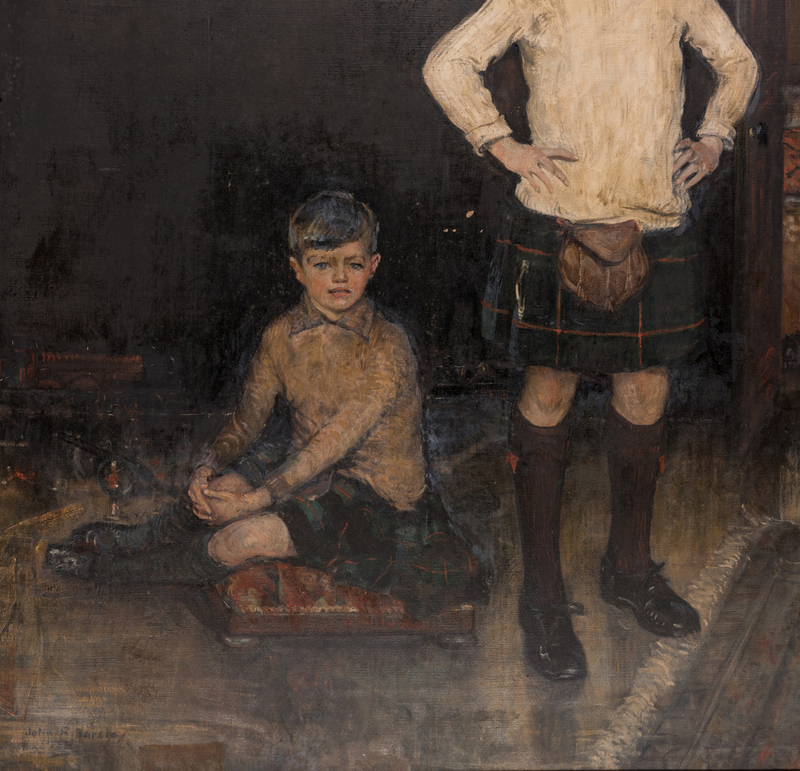 One boy stands with hands on hips, while the other is seated on a low footstool near toy soldiers and a toy train. A hallway and window are visible in the background. Signed lower left John R. Barclay and dated 1925. 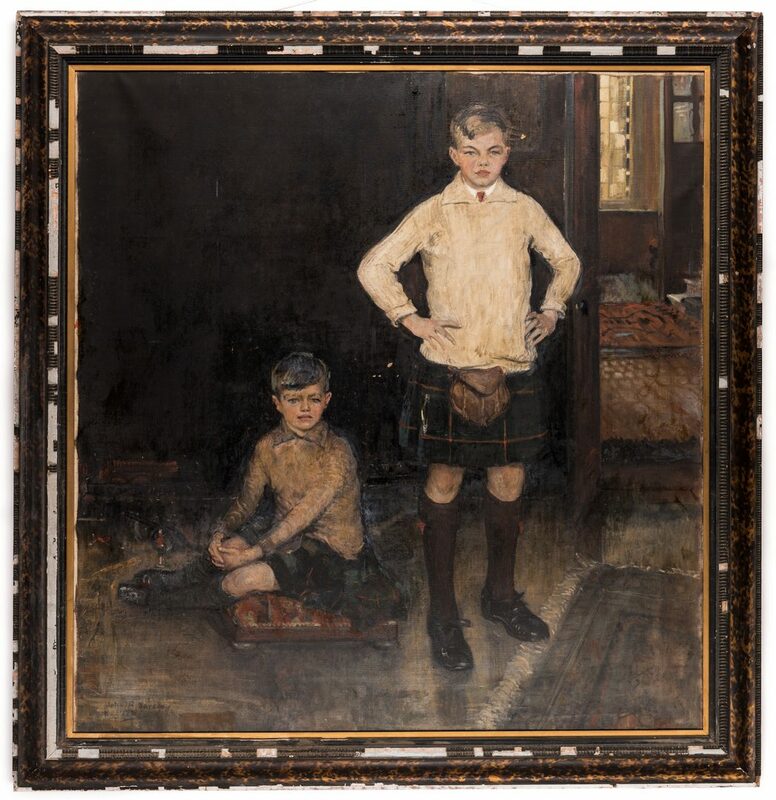 Label verso reads, "Hamish and Alister Gunn painted by John R. Barclay". Original grain painted frame with ripple molded rabbet and outer edges. 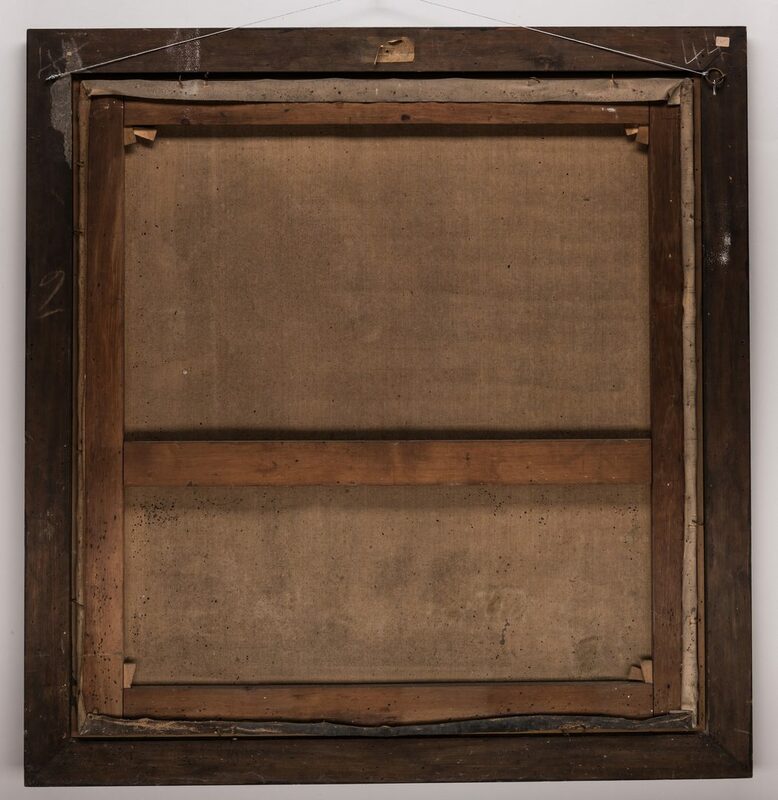 Sight – 41 1/2" H x 39 3/4" W. Framed – 47" H x 49" W. Early 20th century. Provenance: Found in a Frankin, Tennessee estate. 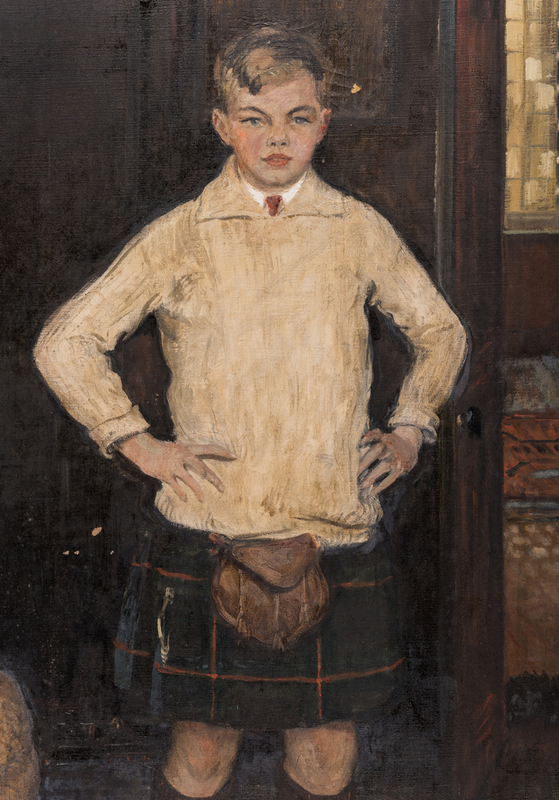 Biography (courtesy Askart: The Artists' Bluebook): John Rankin Barclay, also known as John Rankine Barclay, was born in Edinburgh and trained at the Royal Scottish Academy Schools. 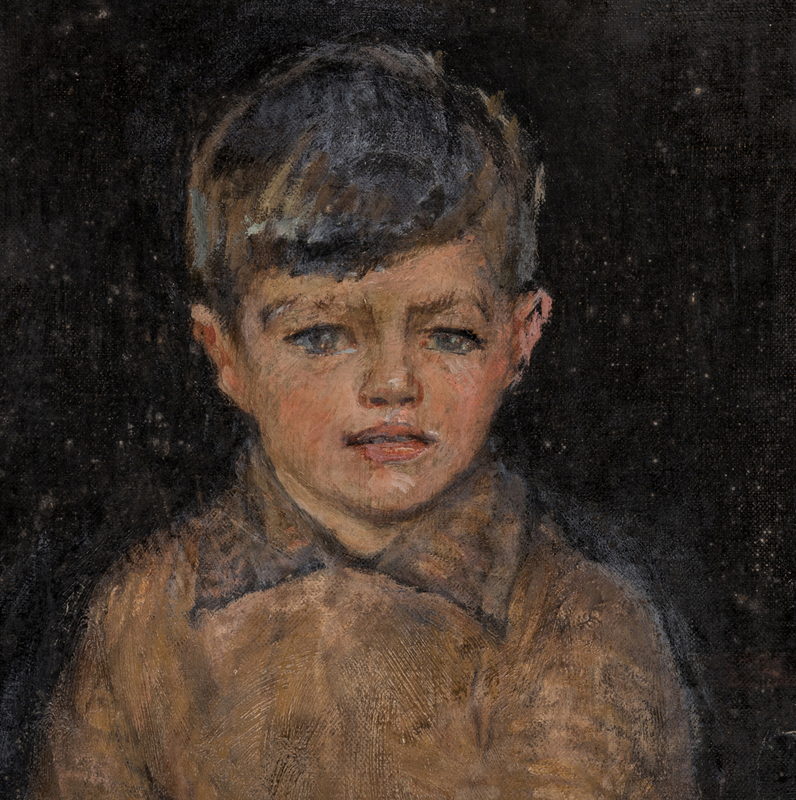 A Guthrie Award and a Carnegie Traveling Scholarship allowed him to visit and work in France, where he was greatly influenced by the French Impressionists. At The Royal Institution, he became a member of the progressive Edinburgh Group of painters which included J.G Spence Smith, D. M. Sutherland, William Oliphant Hutchison, William Mervyn Glass, and A R Sturrock. 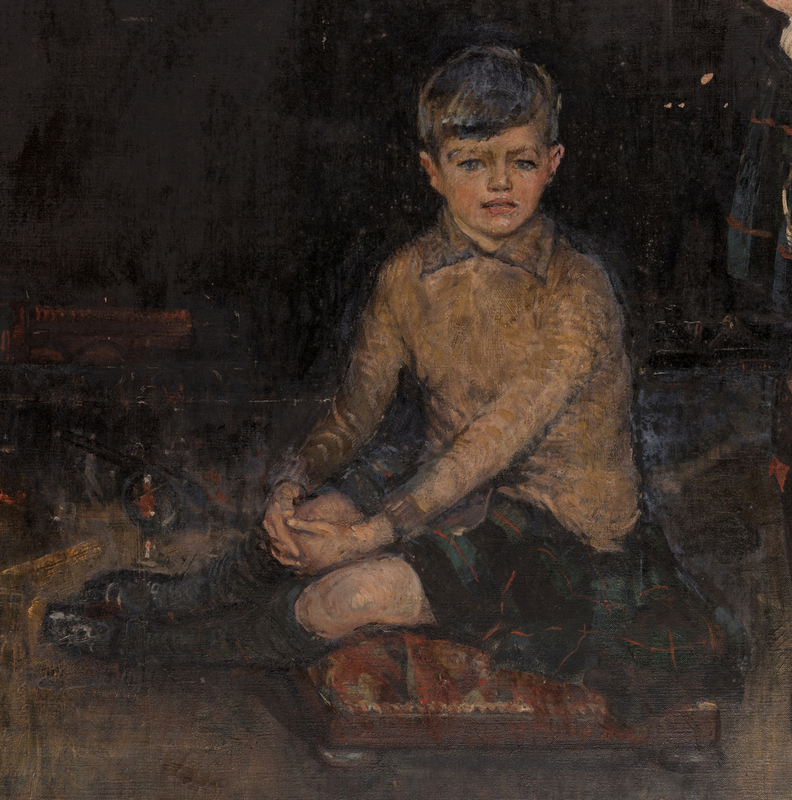 He painted in both oil and watercolour, frequently depicting figures in a landscape or town setting. 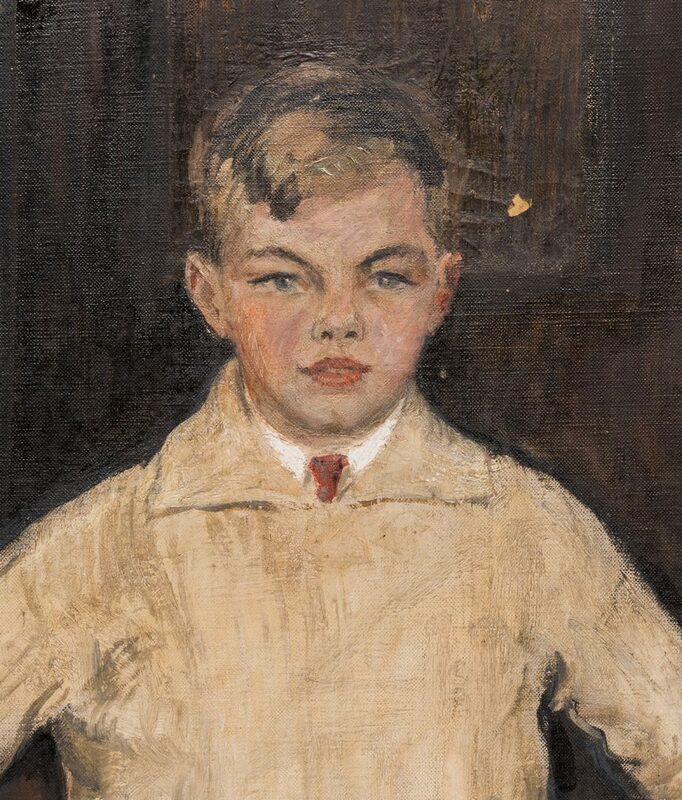 His style was individual and often experimental. His work was exhibited at RSA, RA, RSW and Royal Glasgow Institute of Fine Arts. 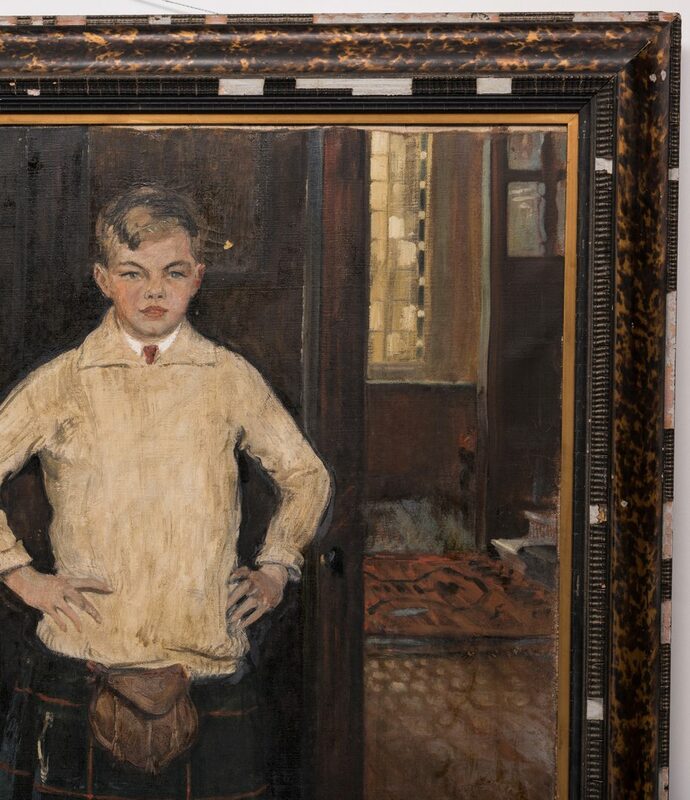 CONDITION: Painting was under glass when found. 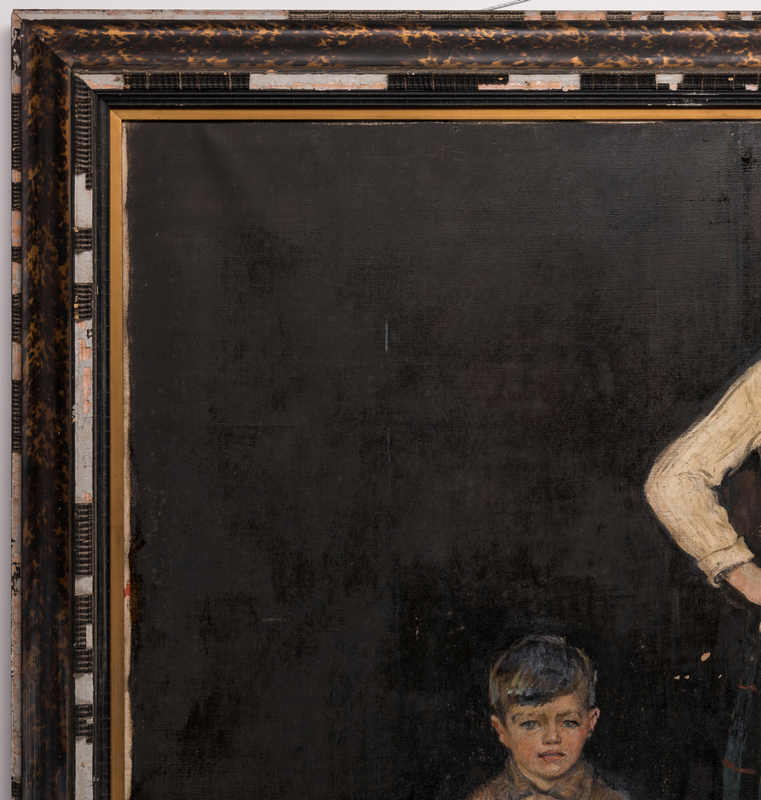 Glass has been removed, but some bloom is present over the varnish on front of the canvas, and there are accrections to the back of the canvas. 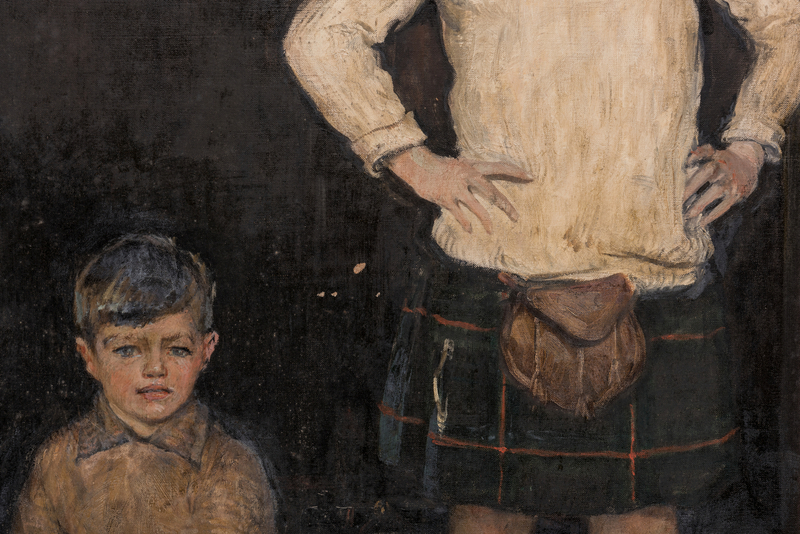 A few scattered small flakes to the background at the center of the painting and to the right of the standing boy's head (largest 1/4"). 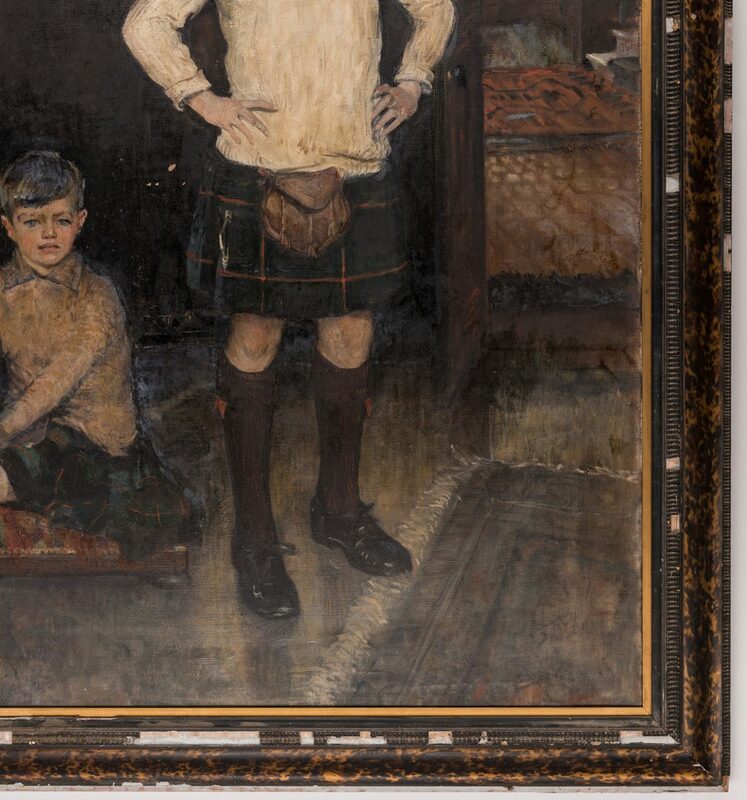 Area of inpainting, lower left of canvas. 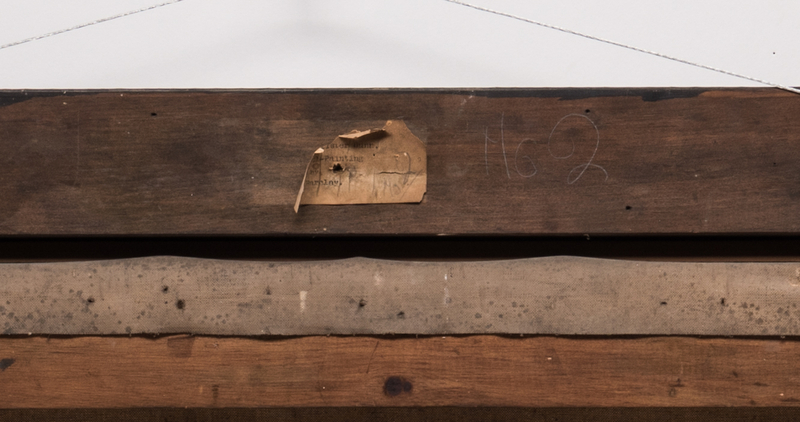 The molded edges of the frame are chipping off, with several large areas of loss. Several chips retained.